This is an adjustable safety razor with two settings - mild and aggressive. 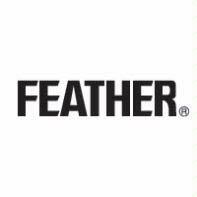 Made in Japan by Feather, manufacturers of what many say are the very best safety razors in the world. Feather are best known for their stainless steel safety razors, however, this razor is made from ABS resin, stainless steel and brass. Most of the razor, in fact, is made from ABS resin. There are two settings, numbers 1 and 2, use number 1 for a mild shave and number 2 for a closer shave. You change the setting by switching a small lever from 1 to 2. The razor comes with a packet containing two Feather blades and printed instructions in English and Japanese. The Feather Adjustable benefits from good dimensions and Twist To Open (TTO) butterfly doors which makes blade changing easy, quick and safe. Setting 1, Provides less blade exposure for a mild shave and best used on fine hair and sensitive skin. Setting 2, Provides more blade exposure for an aggressive shave and best used on dense, coarse hair and normal skin. Changing the blade is so simple, all you do is turn the collar under the head anti-clockwise to open the doors, place a fresh blade in and turn the collar clockwise to tighten. Take care not to over-tighten the doors. To change settings, move the lever under the head to the left or right. Shave with the Feather as you would with any other safety razor, use a light touch and a sharp blade, for tips on technique, watch our YouTube tutorial video which is hugely popular across the world. Budget priced, featuring butterfly doors, a low cost safety razor from the premier safety razor makers Feather of Japan. Ideal for home and travel, generous dimensions yet very lightweight. ABS resin, stainless steel and brass. Most of the razor, in fact, is made from ABS resin.